After a critically acclaimed season at MTC’s NEON Festival, Elbow Room brings We Get It to Brisbane Powerhouse. In this fierce and witty new work, five classic heroines (and the actors playing them) take to the stage in a battle to win it all and to answer the question: can we imagine a world without sexism? The performance begins with the men in the audience literally centre stage. The lights come up, the screen is lit and a booming voice helps us to imagine this world where sexism no longer exists – where women are granted the same rights, pay and opportunities as men. Understandably, the men on stage begin to look uncomfortable. In these opening moments we glimpse the bigger picture of this important work; we may “get” sexism, but there is still a long way to go before achieving gender equality. From here we enter a glitzy glamorous game show complete with five contestants dancing ridiculously in hot pink lycra. It’s a familiar scene, but there’s something disturbing behind the laughter and the fun. As each of the five women are forced to order themselves according to their appearance, personal lives and categories that simply have nothing to do with the competition at hand, a system of institutionalized sexism (and racism) reveals itself. The “message” of the work permeates through the actors’ video diary entries where they recount their experiences as women in an industry dominated by men. It is unclear whether these are the lived experiences of the actors, and in this way the line between the actor, the actor playing an actor, and the actor playing an actor playing a character (and it really does feel that convoluted) is blurred time and time again. In particular the line between reality and fiction is manipulated as the actors talk back to the host, argue their concerns and work to perfect their performance as one of the greatest heroines ever written. These powerful and magnetic moments bring to the fore the problematic portrayal of women through characters written by men hundreds of years ago. Progressively through the performance we see the actors fight back against the ridiculous expectations of the host and us, the audience. It is clear that there is plenty of ground for We Get It to cover, but at times scenes feel too long and blatant declaration of the issue at hand becomes too much to handle. 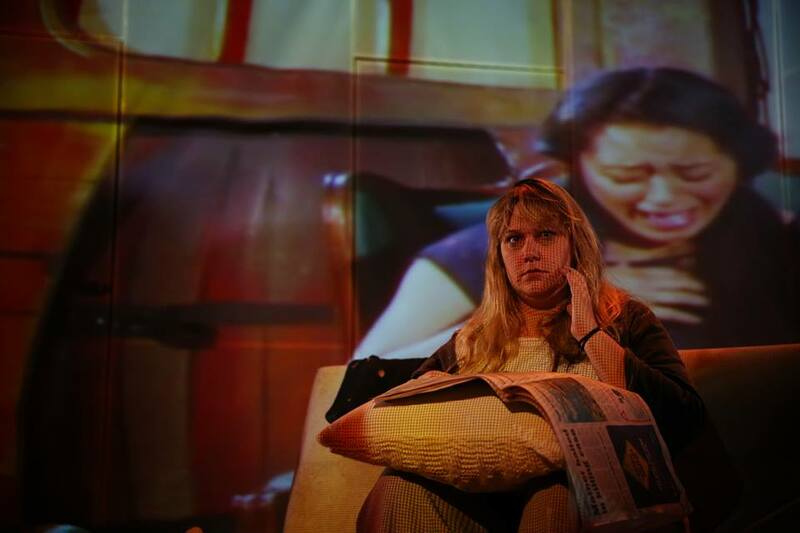 Personally I found the work difficult to connect with – while I empathised with the actors / characters, I struggled to play my own role as the alienated audience member. I wanted more space to come to my own conclusions, rather than being told what it all meant and who was at fault. In addition, I found the work to be exclusive in its use of in-jokes and terminology that only an industry audience would fully appreciate. As a work dealing with an issue relevant and important to all, I believe the work could be more accessible to a general audience that do not work within the Brisbane theatre industry. 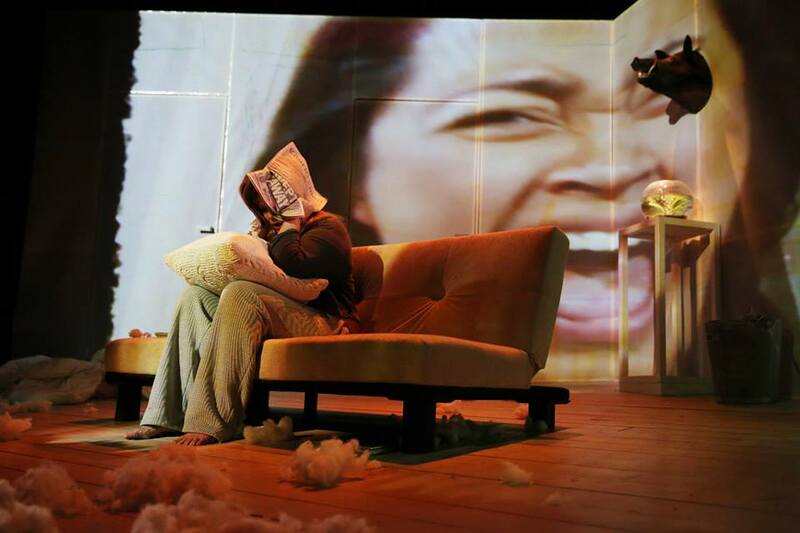 We Get It is a vital piece of political theatre that is uncomfortable, confronting and sharp. It digs deep into the reality of women in an industry that I am just beginning to enter, and it’s frightening to say the least. You might not like this show. On the other hand, it might be the weirdest and most wonderful production you’ve seen in a long time. Trollop is not a nice, neat, fun or family-friendly play. It’s strange and savage, and a little bit sadistic. It’s a shock to the senses, and perhaps to your sensibilities. 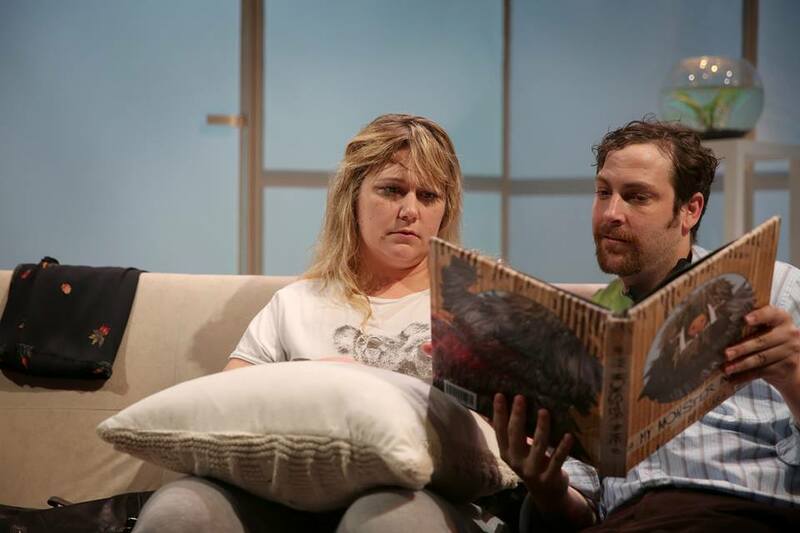 It’s the Queensland Premier’s Drama Award Winner by Maxine Mellor, it’s a world premiere, and far from what you might expect, it’s not pretty. I’m glad I didn’t see it alone. Clara is depressed after something ghastly has happened. We see the muddied trash and broken furniture piled on either side of the paper walled set, a grisly reminder of the floods or the lives wasted along with the debris. If you were there in the cleanup you’ll recognise it. Perhaps you’ll smell it. The mud, I mean. It comes back to you every so often. It does! It’s the first shock of the evening. There are several more, as the tension mounts and the mythical world becomes reality, at least for Clara (and of course for us, watching). Your own nightmares are undoubtedly worse than even the most grotesque images here, but the realisation of Clara’s fears is impressive. With the combined visions and skill sets of four designer-directors – Wesley Enoch, Pete Foley, Ben Hughes and David Morton – and the force of three young actors – Amy Ingram, Lucy-Ann Langkilde and Anthony Standish – The Greenhouse at Queensland Theatre Company have created a monster model that’s so crazy it just might have worked! As Clara, in the throes of apathy and depression, Ingram is always present, even when she’s completely absent from the life that her boyfriend, Erik, wants for her. Despite being silent for much of the play, we hear her loud and clear. 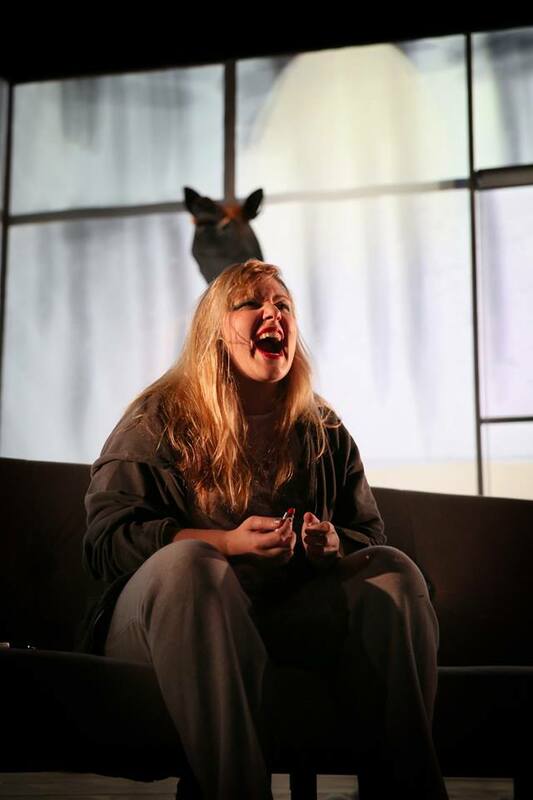 When Langkilde, in her QTC debut, enters as the “strange Jehove” and changes the course of the action, it feels like a device that should work beautifully to break up the heavy discourse between the couple, and distract us from whatever grisly end is nigh. Instead, this section of the play seems like a last-minute consideration – something “normal” to throw us off the scent and settle us into a false sense of confidence because really, the weirdest thing happening here is that Clara wants her boyfriend to kiss the girl! Standish has already stolen the show with comparatively masses of dialogue and action by now, and at this point, when his character is stoned and drunk, willing but confused about whether or not he should follow Clara’s command, he delivers the funniest line of the play… “Something in my head is telling me this is a trick”! Laughter serves as welcome relief from the tense situation at hand, and lets us breathe before it’s too late! Before the big finish takes our collective breath away. I can’t give it away, and I hope no one else does so either, but the big finish is almost as you’d expect, and at the same time it’s nothing of the sort. It’s the mythical become real and we’ve all had similar nightmares. I’m not a Game of Thrones fan – I abhor violence and I don’t think watching it contributes anything of particular value to my life – but I was reminded of a disturbing and fascinating installation at Sydney’s MCA, which I loved and hated, whose artist attributed some of the inspiration for her fur, twine and timber creations (I’m talking about Wangechi Mutu’s Black Thrones) to the graphic imagery of the series. I wondered if Mutu’s unique work had infiltrated Trollop’s creative process at any point. The sound (designed by Chris Perren), particularly a high-pitched sound of such high frequency that it might be the most disturbing element for some, along with some “stranger and stranger” down-the-rabbit-hole-type imagery serve to challenge our imaginations. Flickering video footage is thrown across the sparse white set, establishing the nightmarish mood from the outset and revealing the versatility of Langkilde, who appears as multiple characters, from children’s television show host to David Attenborough style narrator, of which we are later, rather quickly and cleverly, reminded before she walks through the door into existence. (But wait, what of the ICE? I was expecting the “Sofie” story and the impenetrable, prison-like ice surrounds to all come together at some stage, but as in a dream it simply disappeared, giving way to the new “reality” that included Langkilde). Maxine Mellor has penned some strange and truly terrifying thoughts in order for Trollop to live, in this, its first incarnation. Props to The Greenhouse at QTC for getting this beast up on its feet, and the best of luck to the next company desiring to stage it!